CRIMINAL GIRLS: Invite Only | NIS America, Inc. Seven delinquents, seven sins, and only one way out. Just hired for a new, mysterious job, you soon discover that this isn’t your normal prison gig. You’ve been entrusted with the care of a crew of girls whose sins have damned their souls to Hell and an eternity of punishment... Their only hope of salvation is for you to recognize their unique histories, and to guide them along the path to redemption. Navigate through the four trials of the Redemption Program, and motivate your crew of delinquents to learn the skills to redeem themselves, or leave them to their fate. Mind Your Manners – These girls aren’t your typical RPG team –they have minds of their own! To defeat the convicts doing their time in Hell’s dungeons, you’ll need to listen to your team’s desires, and choose your path to victory from the ever-evolving repertoire of skills, spells, and combo attacks that they want to use. ©2013 Nippon Ichi Software, Inc. ©2015 NIS America, Inc. All rights reserved. 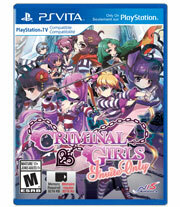 Criminal Girls is a trademark of Nippon Ichi Software, Inc.